This photo was taken in February in northern Indiana. Can you tell what’s in the back there, under the plastic? The reader who shares this writes that it’s from “a company called Lambright Comfort Chairs. They make the Amish version of the LazyBoy recliner. They have small versions that they sell to the RV market.” Another example of Amish seating. I know there have to better titles for this photo than my La-Z-Boy-inspired attempt. I bet that chair is so comfortable. I want one of those hickory rockers I keep seeing everywhere. I sat in one and didn’t want to get up – but they made me. 🙂 Have a great week! I want a hickory bent rocking chair, too! I saw one at a local furniture store and it was on sale for $500 (marked down from $700). 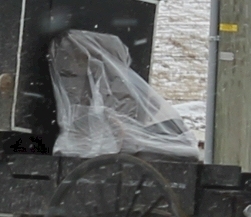 I went to a nearby Amish home and they had one for sale for $175.00. I asked her if one of the men in their district made it and she said it was made in her former community. I know where I’ll be buying it! How about Recline-a-chair? Sounds comfortable to me! Mark has a number of these rockers. He uses them in his living room, bedroom, and out on his porch. Actually, he has a hickory and oak dining room set. The table and chairs are in the same style. He said that he can get them locally for around $150 either at Yoder’s Furniture Store or the Country Variety Store. “Plain and simple sitting” as my mother used to say. My family has been in the RV furniture business for over 30 years and several years ago we discovered Lambright Comfort Chairs. I have purchased these recliners as gifts for family members. Not only do they make a great product, but they are also great people. The chair that I purchased, which I believe is the one in your photo, is referred to as the Lazy Relax-R. Love these chairs! So Comfortable!